One of the most popular and effective tools for witnessing, using colors to present the message of salvation. 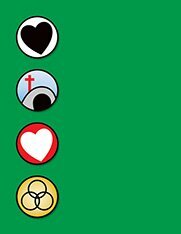 The Wordless Book presents the salvation message using five colored pages to represent Heaven and God's love, the darkness of sin, the blood of Christ, a clean heart and Christian growth. Please 'note' how many "How to Lead a Child to Christ" leaflets you need. An effective witnessing tool, using colors and symbols to tell the Gospel. Symbols shown on the front; "The Wordless Book" sheet music on the back. Children will be fascinated as you share the Gospel using this innovative tool! We will include one leaflet, How to Lead a Child to Christ leaflet with each order of Gospel Flipper Flappers. We recommend How to Have a Special Friend tract to give to each child with a Gospel Flipper Flapper. Flip the flaps to reveal symbols and colors representing Heaven and God's love, the darkness of sin, the blood of Christ and a clean heart. The green of the Gospel Flipper-Flapper represents Christian growth. Keep one in your pocket or purse to share the Gospel at a moment's notice! Small version 3.5" x 3.5"
Larger version of the Gospel Flipper Flapper to use in a classroom. Children will be fascinated as you share the Gospel using this innovative tool. Flip the flaps to reveal symbols and colors representing Heaven and God's love, the darkness of sin, the blood of Christ and a clean heart. 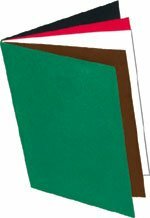 The green of the Gospel Flipper-Flapper represents Christian growth. We will include one "How to Lead a Child to Christ" leaflet per order. This evangelism tool allows you to keep the Gospel at your fingertips. Includes Gospel symbols with scripture, plus "Getting to Know God Better" points to encourage Christian growth. Ideal for counseling, follow up, training classes or to be given to children as a witnessing tool for their use! 2 3/4" x 7 1/2" Packs of 25. 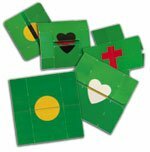 This simple tool uses the Wordless Book colors and symbols to represent Heaven and God's love, the darkness of sin, the blood of Christ and a clean heart. The green of the Gospel Turnaround represents Christian growth. Kids can share the Gospel with their friends using this evangelism tool. 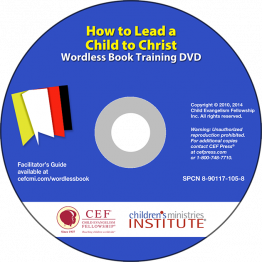 We will include a "How to Lead a Child to Christ' leaflet with each order that explains how to teach the symbols. 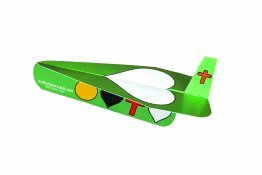 As you fold this plane you can display different symbols representing God’s love, the darkness of sin, the blood of Christ and the clean heart given to those who believe. The green color of the plane also represents Christian growth. This plane can be a fun, interactive way to share the Gospel with children. The Gospel Plane requires a coin the size and weight of a USA penny. We will include a "How to Lead a Child to Christ' leaflet with each order that explains how to teach the symbols. Leaflet explains the Gospel to children using the Wordless Book colors and symbols. Truths about God, sin, Christ's death and resurrection, the child's response, and Christian growth. A compliment companion to the tract, "How You Can Know God." One leaflet included free with each order of Wordless Books. Here's a creative idea to keep the Gospel "on hand"! These plastic gloves use Wordless Book colors plus pictures and corresponding verses to tell the salvation story. Give a glove to each child and encourage him to use it to tell his friends about Jesus' love. Spanish Instructions for the Wordless Book, Gospel Flipper Flapper or Gospel Turnaround. We will include one free with each order of any of these products.